A Funnel defines a series of actions that you expect your visitors to take on their way to converting a goal. By defining a funnel, you can improve your conversion rates, sales and revenue as you can determine where you lose your visitors in converting your goal. 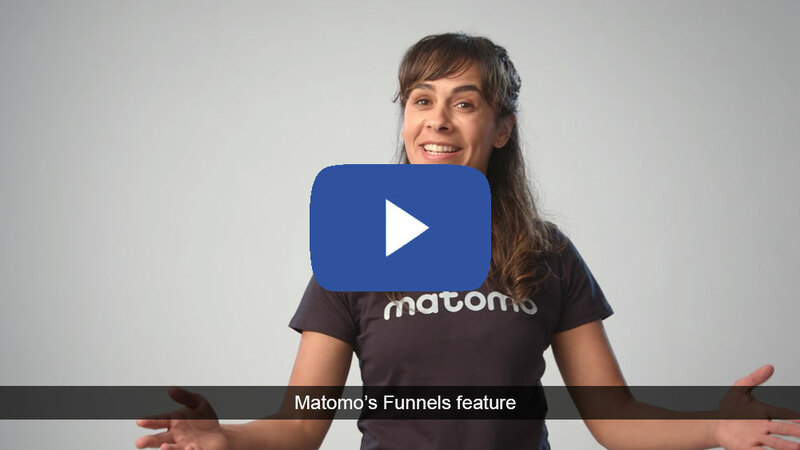 Funnels is a premium feature which is included in all our Cloud-hosted plans or you can purchase it on the Matomo Marketplace if you self host Matomo On-Premise. Learn more about all the benefits and features of Funnels. Log in to your Matomo (Piwik) and click in the left reporting menu on “Funnels”. The “Funnels Overview” page shows you an evolution of all of your currently activated funnels. You can click on any funnel title to get to the funnel report or select a funnel of your choice from the left menu. A funnel won’t appear in this overview or menu if it is not activated. An evolution graph showing you at a glance how important funnel metrics like the “Funnel conversion rate”, “Number of funnel conversions”, “Number of funnel entries” and others perform over time. A funnels summary showing you the most important funnel and goal metrics, the possibility to view the visitor log with all the visitors that have entered this funnel and a table letting you instantly see how your funnel is configured and performing. A funnel report showing you where your visitors entered your funnel, where they exited, and how many proceed to the next step. For each step you can get more insights. For example see referrer details of visitors that have entered a step directly, view the visitor log showing the visitors that have passed this step and you can see the evolution for each step to get ultimate insights how each step is performing over time. Funnels also enriches a regular goal report showing you an overview and evolution of your Funnel. From there you can see the funnel details with just one click by clicking on the Funnels headline. You can apply Matomo (Piwik) segments to your Funnel reports and Funnels also adds new segments to your Matomo. Did you know? Funnel reports are shown in the Matomo Mobile app, work with Scheduled Reports and Custom Alerts. To get to the “Manage Funnels” screen click in the reporting menu on “Goals” and then “Manage Goals” or in the personal menu on “Manage Goals”. Funnels can be configured when you create or when you edit a goal and it integrates very nicely into the Matomo (Piwik) goals management. For example in the list of all goals you can directly see which goals have a funnel configured. To configure a funnel, click on “Add a new goal” in the bottom left or select a previously created goal. The form will ask you to enter the basic goal information as usual and in the bottom additional form fields will appear that let you configure and validate your funnel. The funnel will be updated when you click on “Add goal” or “Update goal” as usual. During the whole process of configuring your funnel, Matomo (Piwik) will show you help text explaining what each element means and what to do next. This is especially helpful when you have not used funnels before. When you set up a Funnel, it is critical that you make sure your funnel is configured correctly. That’s why we focussed on making this step as easy as possible for you compared to other tools in the market. You can enter a URL to visually see which steps match a certain URL and we show you which previously tracked URLs matches a step configuration so you know whether your step is configured correctly. The last step is to activate your funnel. Once you have activated a funnel, Matomo (Piwik) will start generating reports for your funnel and a menu item will appear in the reporting UI. If you are later not interested in this funnel anymore, simply deactivate the funnel a later point. Once you have activated your funnel, we still recommend to test your funnel manually by going to your website or app and clicking through the path you have configured, and then checking that the funnel report includes your own visit in each step you have entered. We compiled a list of the most frequently asked questions in the Funnels FAQ. You can get Funnel for Matomo (Piwik) on the Marketplace.